Compared to the Mares Abyss, the Spiro Arctic seems a bit bulky. The second stage especially, as it mainly consists of a huge piece of white plastic, which looks like a giant snowflake (probably intentional due to the name). The first (non swivel) stage (balanced diaphragm design) has two 7/16" high-pressure UNF ports and four low-pressure ports (3/8" UNF ports), enough to attach all necessary items. Immediately noticeable is the huge rubber hand wheel that is used to attach the Spiro Arctic to the tank. Of all the regulators I have tried out so far, none was as easily screwed into the valve on the tank as this one! Using the aforementioned wheel I attached the regulator to my tank and went diving. In order to test it properly I had decided to do a few easy dives in our local lake, the Ilsesee, followed by a few deeper dives in Lake Starnberg. However, I immediately noticed that something about the regulator was not right. It was exceedingly difficult to breathe, the regulator drew water with each breath and the air tasted funny. After the dive I tested the low pressure and found out that it was much too low according to the regulator's specifications. I decided to take the reg apart, together with a friend who was qualified to service Aqualung regulators (the mother company of the Spiro). We were both shocked at what we found: In the first stage the sealed chamber, which is normally filled with oil, was two thirds full of water, there were traces of graphite in the second stage and there was a tear in its membrane. When questioned, the previous owner admitted that a friend of his had "serviced" the regulator! What did I learn from this experience? insist on being handed over the documentation of the last service and then call the shop to check if they really did the service as stated. get the regulator serviced anyway - trust is good, control is better. Once the Spiro Arctic had been properly serviced and the low pressure had been adjusted to the correct level, I thoroughly tested the regulator. This time there were no problems. The level of breathing comfort is not quite as high as for the Mares Abyss, but that level is hard to reach for any regulator. 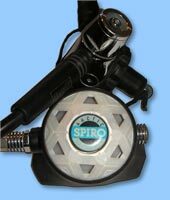 However, breathing resistance was low and even at a depth of over 30m/100ft the Spiro Arctic reliably delivers enough air. It is very important for the second regulator to be equal to the primary one, i.e. it has to be reliable at depth and in cold water. 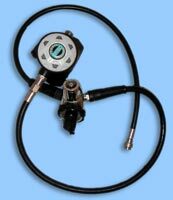 A cheap back-up regulator is of no use to a diver in distress whose primary just packed up. If the good regulator ran into problems, how should a second-rate reg cope? It is therefore advisable to invest a little bit more when purchasing a back-up regulator - your life might depend on it. Although, as far as I know, this regulator is not produced any more, there are still a lot of divers around who would not swap this one for a newer model. So if you're looking for a reliable, not too expensive back-up, have a look on eBay. 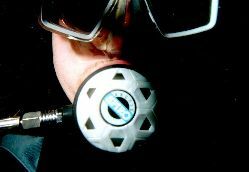 Although I, too, can't complain about the Spiro Arctic, I hardly use it anymore as I now dive with the regulator combination Apex CTX 100 / Mares Abyss. I always take it with me to club outings, though. If anyone is without a back-up reg, I can give that diver the Spiro Arctic, knowing that it is a reliable and safe regulator.